“Between Safaricom and Airtel, which one has a faster Internet in my town?” is a question we have received almost on a daily basis ever since we published the article – Safaricom is currently offering the best Mobile Internet in Kenya. 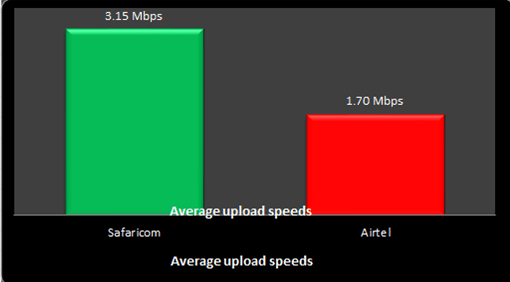 Kenyans from Nairobi all the way to Mombasa and Malindi in the coast, to Malaba and Migori in the West, to Isiolo, Meru and Nyeri in central towns, want to know how Safaricom and Airtel Internet compare in terms of speed and reliability. To provide them with this information, we set out to conduct a research that has enabled us to conclude that on average, Safaricom Internet is twice as fast as Airtel Internet across Kenya. The research was conducted by Kachwanya.com team between August 17, 2016 and August 21, 2016 in 40 towns as indicated in the table below. In each town, five locations (hotspots) were chosen at random from where Safaricom Internet and Airtel Internet were tested. The tests were done using the Ookla Internet Speed test app that can be found on Google Play Store by following this link. The data of interest was the recorded download and upload speeds. 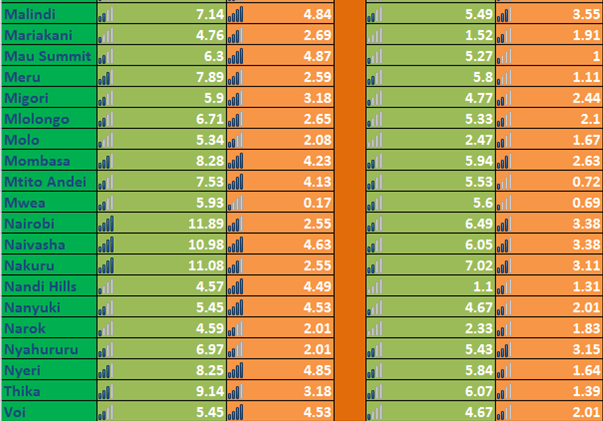 The average download and upload speeds were then calculated and tabulated for each town as shown. On town averages, the highest download speed was 11.89Mbps recorded in Nairobi for Safaricom Internet and 8.56Mbps recorded in Kisumu for Airtel Internet. 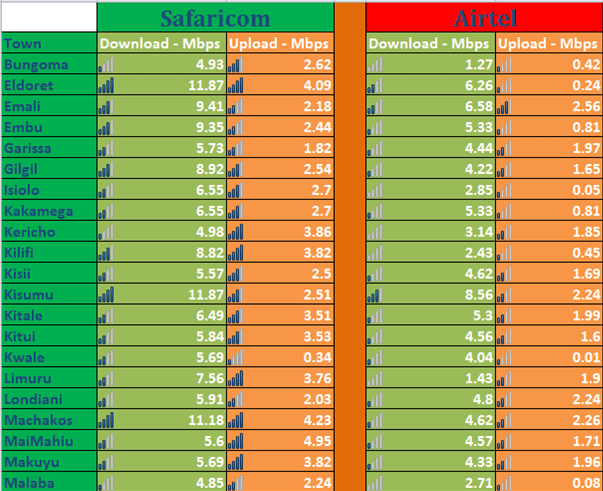 The top five towns with the highest download speeds on Safaricom Internet were Nairobi, Eldoret, Kisumu, Machakos and Nakuru with average download speeds of 11.89Mbps, 11.87Mbps, 11.87Mbps, 11.18Mbps and 11.08Mbps respectively. Airtel Internet on the other hand registered top speeds in Kisumu, Nakuru, Emali, Nairobi and Eldoret with average download speeds of 8.56Mbps, 7.02Mbps, 6.58Mbps, 6.49Mbps, and 6.26Mbps respectively. The five towns with the slowest Safaricom Internet are Nandi Hills, Narok, Maraikani, Malaba and Bungoma with average download speeds of 4.57Mbps, 4.59Mbps, 4.76Mbps, and 4.85Mbps respectively. Nandi Hills, Bungoma, Limuru, Mariakani and Narok recorded the slowest Airtel Internet dowload speeds at 1.1Mbps, 1.27Mbps, 1.43Mps, 1.52Mbps, and 2.33Mbps respectively. 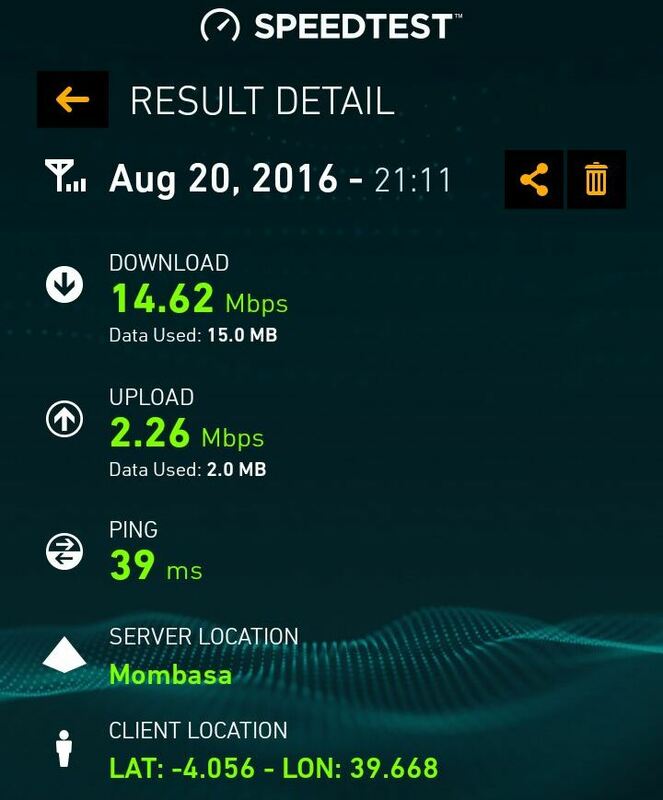 By location however, Safaricom Internet was able to achieve a download speed of 15.18Mbps with a corresponding upload speed of 4.23 Mbps at a place Google maps identified as Sultan Hamud along Nairobi-Mombasa road in Makueni County. On the other hand, Airtel download speed reached an upward of 14.62Mbps with a corresponding upload speed of 2.26Mbps at Dreamline Bus Station, Mombasa. 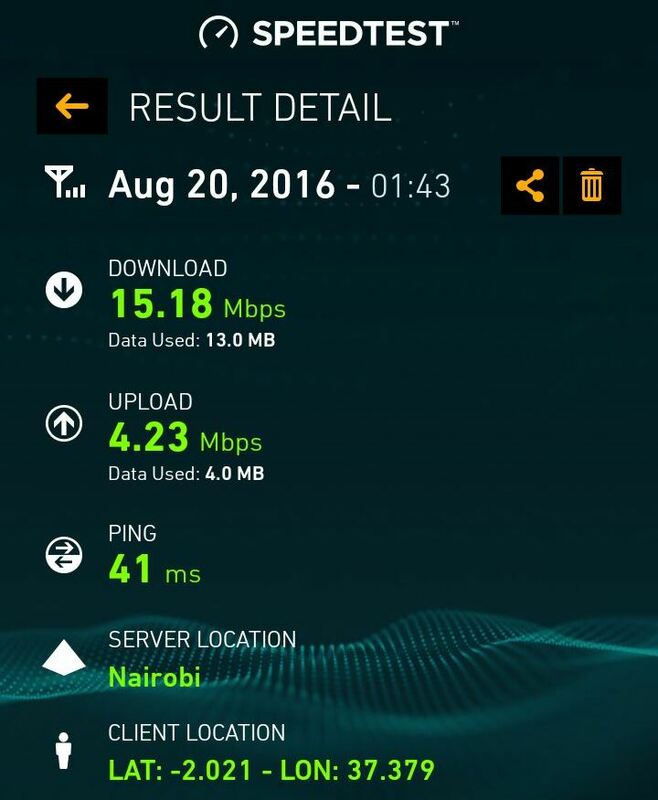 The slowest recorded upload speed for Safaricom was recorded as 0.57Mbps with a corresponding download speed of 3.63Mbps recorded just past Kinoo while on the road to Nakuru. 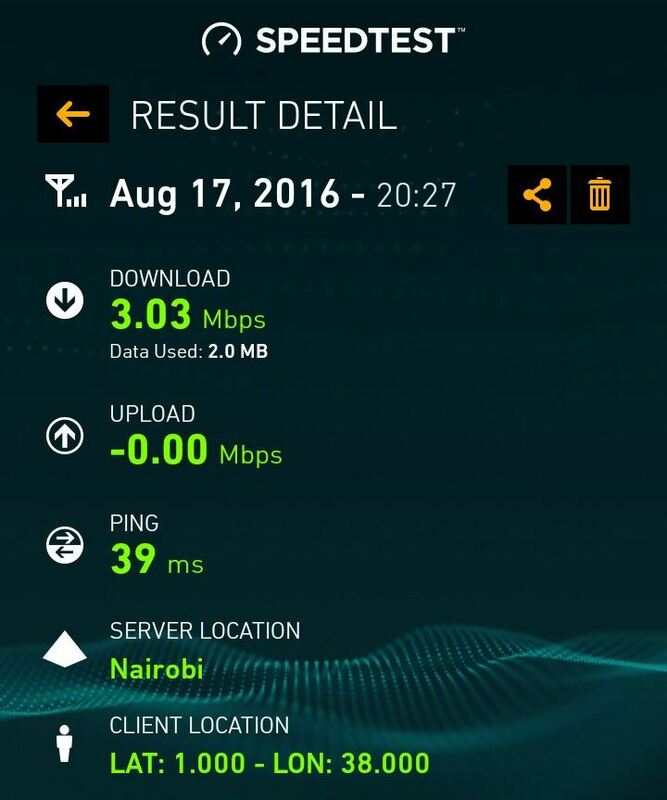 Similarly, the slowest upload speed for Airtel was -0.00Mbps with a corresponding download speed of 3.03Mbps recorded at location in Isiolo. 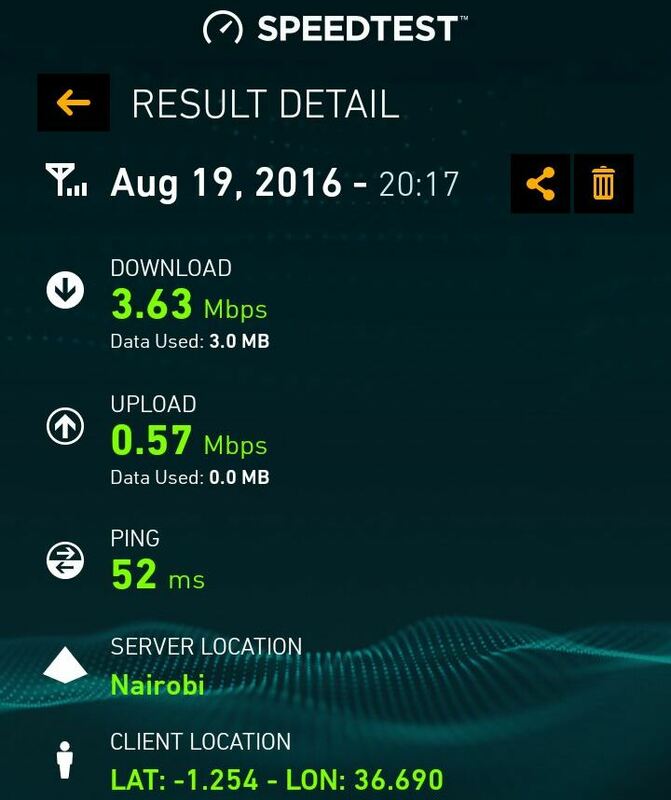 On average, Safaricom Internet download speeds came to 7.26Mbps whereas the upload speeds came to 3.15Mbps. Airtel Internet on the other hand was able to achieve an average download speeds of 4.60Mbps and 1.70Mbps for the upload speeds. Although Airtel Internet was able to outperform Safaricom Internet in a few locations in a number of the towns we visited, overall (after averaging location data per town), Safaricom Internet speeds outperformed Airtel Internet in every single town that we visited; implying that nationally Safaricom Internet is way faster than Airtel Internet both in download and upload speeds. 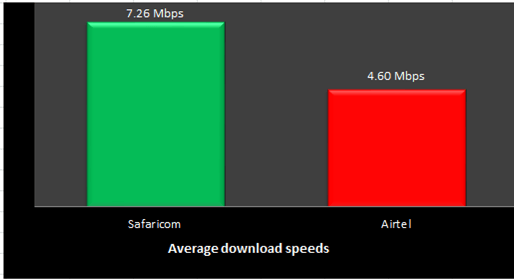 In several instances and in a number of towns, Safaricom Internet outperformed Airtel Internet by factors above 2, although averaging the data the outperformance comes to a factor of 1.6 for download speeds and a factor of 1.9 for upload speeds. Finally, it is important to mention that while travelling, Airtel 3G Internet was absent in a number of “middle of nowhere” locations – with the Airtel 3G only being available in major towns. Safaricom Internet on the other hand was almost always available along all the major highways, whether traveling to the Western parts of the country, to the coastal regions, or towards the central parts including Garissa and Isiolo.